Photo: Students, faculty and staff participate in South Carolina’s “Read-In” at the State House. The College of Information and Communications has received a $100,000 Hearst Foundations grant to strengthen South Carolina communities through comprehensive literacy efforts. 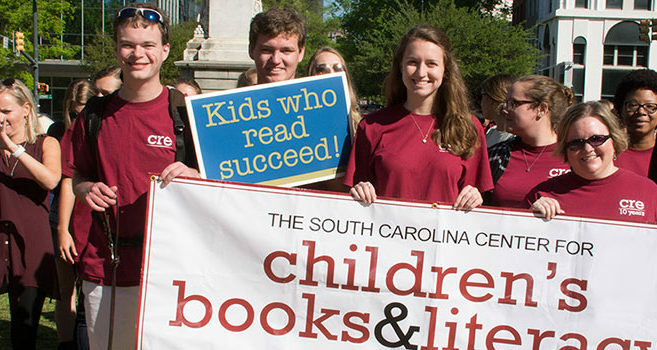 The grant will fund the Community Based Literacy Initiative, a partnership between the South Carolina Center for Children’s Books and Literacy (SCCCBL) and USC’s College of Education. The initiative builds upon work already being done by Cocky’s Reading Express, SCCCBL’s statewide outreach program. “Reading is the foundation for success in school, the workforce, and in our democratic society,” said Dr. David Lankes, director of the School of Library and Information Science. College of Education faculty members Heidi Mills, Beth White, Eliza Braden, Michele Myers and Thomas Hodges helped pitch the idea to Hearst. They say the purpose of the initiative is to create a framework that arms all community stakeholders with the tools needed to tackle illiteracy. “Children, families, teachers, administrators and community organizations will learn how to lift literacy engagement and learning in ways that help all members of the community, tall and small, fall in love with books and make reading a habit of the heart and mind,” the team said in a group statement. Kim Jeffcoat, executive director of SCCCBL, believes Cocky’s Reading Express is an ideal cornerstone for the initiative. “Since our founding 11 years ago, we have developed into a family literacy initiative that focuses not only upon traditional literacy skills but also financial, nutritional, healthcare and environmental literacies,” Jeffcoat said. The grant is one of the largest ever awarded in support of Cocky’s Reading Express. Funds will be used to develop and launch innovative programming in a pilot community with future expansion into larger populations possible. Work on the project will commence in the fall. For more information on the Hearst Foundations, visit https://www.hearstfdn.org/.